We mentioned earlier that our paper focuses on discussing the validity of our data. We do often receive emails asking for clarification on questions, showing that you all are motivated to provide accurate data - thank you for that! Still, collecting online measurements is not perceived to be as reliable as those collected through in-person assessments. 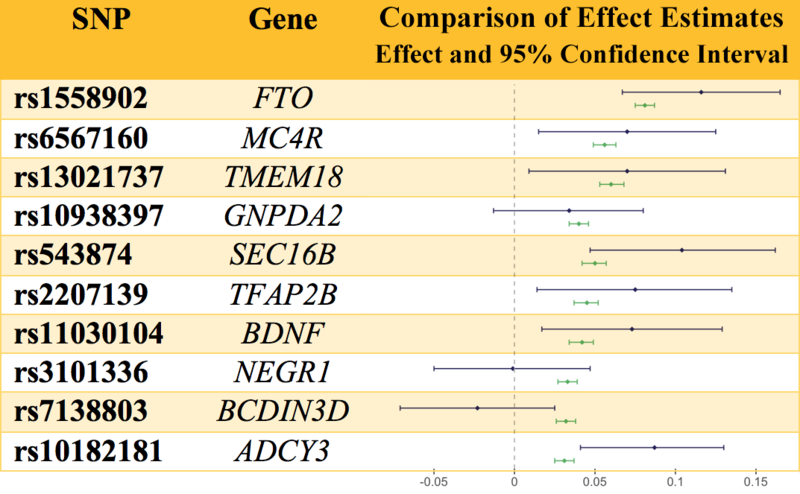 So, we’ve been running simple analyses on Genes for Good data to see if what we find is consistent with what’s expected. In this analysis, we tested for associations between genetic markers and BMI and compared our results to the largest genetics study of BMI to date, published in 2015 by Locke. We were able to replicate his findings pretty well, which is a promising sign that we are collecting valid data (similar to our exploration of diabetes in a previous newsletter). Below, the green lines represent results from Locke; the blue lines are results from Genes for Good. The dot in the middle of each line represents our calculated effect estimate, i.e. how much of an impact each particular SNP has on BMI. So, a value of 0.05 would mean that having the alternative allele is associated with 0.05 standard deviations higher BMI on average. The endpoints of each line - our confidence interval - represent our uncertainty and the range in which we expect to find the true effect estimate. You can see that Locke, whose study contained hundreds of thousands of participants, is less uncertain about his estimates than us - we conducted this analysis with just a few thousand! Considering the vast difference in sample size, we are pleased to see that our results are similar, indicated by the overlapping pairs of confidence intervals. We are all excited about what this means! Please don’t hesitate to reach out to us if you would like a deeper explanation of the table above - we are always happy to discuss further.